We are half way through my book study. Some blogging friends and myself are sharing our thoughts each Monday until mid-November about the book "The Book Whisperer" by Donalyn Miller. You can get to the other ladies posts at the end of this one. You might even see a few freebies along the way! Chapter 4 is so full of information! I figured I would share the two aspects that made me really thing about my teaching style. Donalyn describes her first few weeks of school and how she build the love of reading in her classroom and gets her students to trust that her recommendations come from a reader's perspective, not that of a teacher. She writes about a class discussion on how to choose books. Her students give her answers like you would expect: "I look at the cover" or "I read the back". She has to help them with questions like, "Who has chosen a book because it is short? Who has chosen a book to read by checking how long it is?" Before they will be honest with her, she has to be honest with them. I know I've selected a book before because it was short. Who hasn't? And why isn't that okay to share with my students? Really, it is. Thanks, Donalyn for making me realize that! I was really hesitant when I heard that Donalyn requires her students read 40 books in the year. I think a realistic goal for my grade 4s would be 20. Her students are only 2 years older and need to read twice as many books?? I was really happy when I got to page 76 and she provided her justification. She's right - if you have high expectations, your students will rise to meet them. But again, I think 40 is just too many for grade 4. So, I'm going with 30. If it's too easy, then awesome! I will up it to 40. If it's too difficult for some (which I know there will be some that this will be a big challenge for) we will take Donalyn's approach here too: she celebrates with the students who didn't meet the goal by having them compare how many books they read this year compared to last year. Celebrating this achievement is so motivating and uplifting. I think it's important to note that I would NEVER create some sort of challenge board display. You know, with the rockets launching toward the moon type thing. Who ever is in the back with that rocket without enough jet fuel is just going to feel terrible about themselves, and really, we don't need that. Celebrate successes, people. I really am getting more excited about the reading requirements, even as I type this. The very first reading expectation in the B.C. curriculum for every grade is "read and demonstrate an understanding of a variety of literary, graphic, and informational texts, using a range of strategies to construct meaning". So really, this book requirement is perfect - and it adds in student choice, which we know is oh, so important. I did change my requirements from Donalyn's, by lowering some numbers to match my 30 book goal, but also by adding in two categories: graphic novel and adventure. I'm sure that these could really fit into other categories, but I want to make sure students view books of these categories too. I did have a tough time deciding on numbers, and I'll admit, these may reflect my choices. Okay, they do. I'm not a fantasy or science fiction fan. I don't really like historical fiction. I did keep the chapter book choice the same as Donalyn presents: 9 books. That way, students can find their book niche and stick with it if that's what they'd prefer to do. Donalyn says books over 350 pages count as two books, which I like as it prevents students from selecting books only because they are short. I introduced this to my class this past week. They are really excited about it! I told them that if they were currently working on a novel it would count toward the challenge when they had finished. I have two students with a book checked off already! I'm hoping some read over this 3 day weekend and will be able to start of their challenges as well. 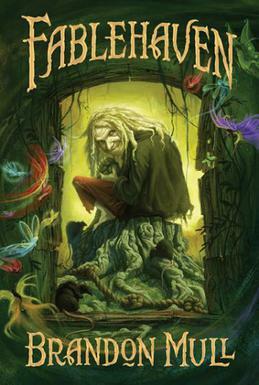 I'm currently reading "Fablehaven" by Brandon Mull. This book came to me by recommendation from a student. I've started doing a Book Frenzy every Monday. During this time students can recommend books to one another and book shop. I was really hesitant to say I'd read the book because it was out of my genre. But then, I realized that would be totally hypocritical! So, I'm reading "Fablehaven". And I have to tell you, I love it. I can not wait until Book Frenzy to tell my student how much I am loving his recommendation! How do you give your students reading freedom? What are some of your favourite reading lessons to start out the year? Read more about Chapter 4! I'm also impressed that you've already started your Friday Book Frenzy. I like that name! I'm going to do something similar, Grade 1 style. - Audio books are allowed. - Books read during calm down time with an EA also count. - Guided reading books count. - Chapter books a parent reads at night will also count for these students. Book Frenzy every Friday! Ahh you're really making me wish I was back in the classroom right now (on mat leave)! I am loving that you're having great success with your students! Thanks for the list of adaptations for developing readers, those are great!